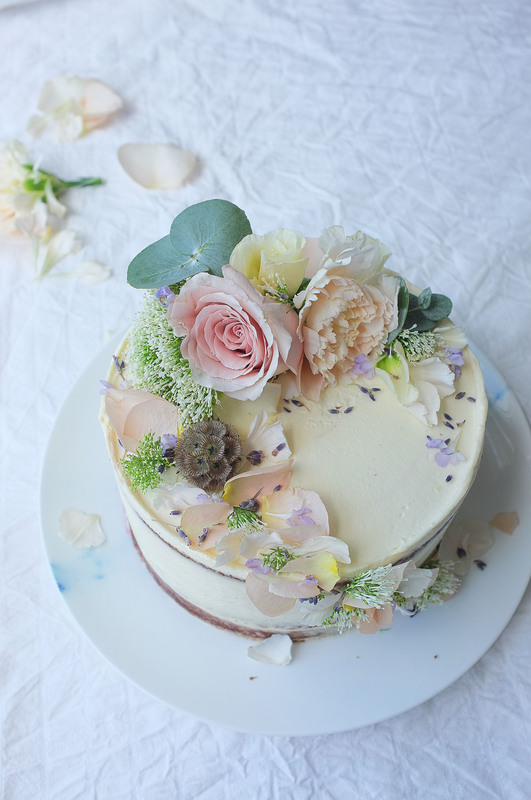 This cake, decorated with whimsical blooms from the Eloise bouquet by Bloom and Wild, is made up of four layers of moist hazelnut sponge soaked in lavender honey syrup, filled with a fresh blackberry compote and covered in delicately flavoured lavender mascarpone cream. 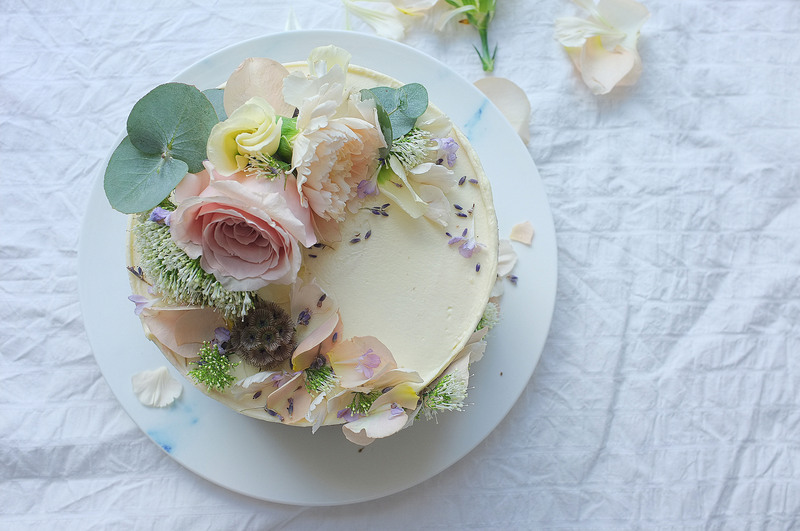 The bouquet is inspired by a summer meadow, so it seemed only right to pick out some of my favourite ingredients the British countryside has to offer for this recipe; together the balance of nutty, floral and fruity flavours are delicious. Try this one out in August/September for a really special seasonal centre piece. Now make the blackberry compote by gently heating the blackberries, honey, lemon zest and juice in a saucepan. Stir occasionally, until the blackberries release their juices and reduce down to form a compote consistency. Set aside to cool. Preheat the oven to 180c. Grease and line two 8 inch cake tins. Place the softened butter and sugar in a large bowl (or bowl of a stand mixer) and beat until very light and fluffy (about 5 minutes). Add the eggs, one at a time, beating very well between each addition (add a tablespoon of the flour each time to prevent curdling). Once all the eggs are well incorporated, fold in the ground hazelnuts, remaining flour, baking powder and salt with a large metal spoon. Divide the mix between the prepared tins and level the tops. Bake for 35-40 minutes (or until well risen and a skewer comes out clean when inserted). Once baked, prick the surfaces of the cakes with a fork and spoon over 3-4tbsp of the lavender honey syrup, then leave to cool completely in the tins. While the cakes are cooling, make the lavender mascarpone cream. Put all the ingredients in a large bowl (or bowl of a stand mixer) and whisk until thick and spreadable. Scrape half the mixture into a piping bag. Now you’re ready to assemble the cake (providing all your elements are completely cool!). To put the cake together, slice the sponges in half horizontally (so you have four even layers). Place the first layer down on your chosen plate and pipe a thick ring of mascarpone cream around the edge, then fill the middle with one third of the blackberry compote and repeat this until you’ve stacked up all four layers. With the remaining mascarpone cream, cover the cake and smooth with a palette knife. Decorate with blooms from the Eloise bouquet or freestyle with hazelnuts, fresh blackberries and lavender. This recipe is the first in a two part collaboration with Bloom and Wild, the letterbox flower delivery service. They’ve recently launched a collection of bouquets inspired by three well recognised destinations we all associate with summer; the tropics, the meadow and the desert. This week I’m going all club tropicana with the Ines, a bouquet inspired by the flora and fauna of, you guessed it, the tropics. 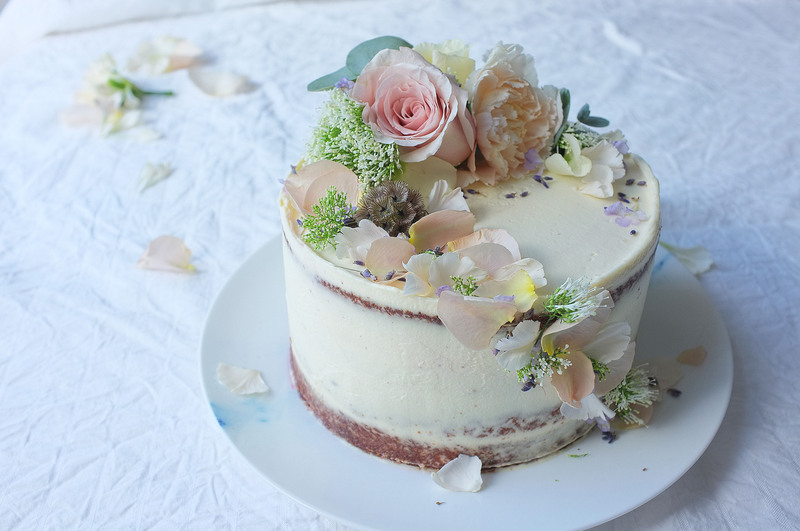 The cake I’ve created to reflect this theme boasts four coconut sponge layers, a filling of caramelised pineapple and rum caramel, and a lime cream cheese frosting. It really delivers on flavour and if you’re throwing a birthday party any time soon would be a great centre piece… Also, the UK feels like the tropics at the moment anyway so you might as well go the whole hog and theme your baking accordingly (nearly went a whole post without mentioning the weather there… NEARLY). Grease and line two 8 inch cake tins. Preheat the oven to 160c. Start off by making the sponges. Place the butter, caster sugar and lime zest/juice in a large bowl (or bowl of a stand mixer) and beat together until very light and fluffy (about 5 minutes). Add in the eggs, one at a time, beating well between each addition (add a spoonful of the flour every now and then if you’re worried about curdling). Once the eggs are well incorporated, add the flour, salt and desiccated coconut and fold carefully with a large metal spoon. Finally, fold through the coconut yoghurt. Scrape the batter into the two cake tins and level off the tops. Bake for 35-45 minutes or until the sponges are golden and a skewer comes out clean when inserted. Once baked, set aside to cool in the tins. Increase the oven temperature to 180c. Slice the pineapple into even chunks, discarding the skin and central core. Soften the butter slightly and mix together with the sugar. Line a baking tray with greaseproof paper and dot over half the butter mixture then place the pineapple pieces over the top in one layer. Top with the remaining butter mixture then place another piece of greaseproof paper on top and finally, add another baking tray to weight it down. Place in the oven and cook for 20 minutes, then turn the pineapple pieces over and cook for another 15 minutes (or until golden and caramelised). Once caramelised, roughly crush the pineapple then set aside and leave to cool completely. While the cakes and pineapple are cooling, make the rum caramel. To do this simply tip the sugar into a heavy bottomed pan and gently heat until it melts (do not stir, just swirl the pan occasionally). Once the sugar has melted, allow it to reach a deep golden colour then add in the butter and stir (it will spit a little so be careful). Now add the cream and stir again. Cook out for a further 2 minutes on the heat, then remove from the hob, add the rum and stir once more. Set aside to cool. Finally, make the cream cheese icing. Place the butter in a large bowl (or bowl of a stand mixer) and beat until light and smooth. Add half the icing sugar and beat again (cover the bowl with a clean damp tea towel to avoid an icing sugar explosion) until well combined, then add the rest along with the lime zest. Once these ingredients are well combined, add the cream cheese and beat until smooth. Once all the elements are cool, it’s time to assemble the cake. To do this slice both sponges in half horizontally (so you have four even layers) and place the first down on your serving plate of choice. Mix half the rum caramel in with the pineapple (reserve the rest for drips). Pipe a ring of cream cheese around the edge of this layer and fill the middle with your pineapple mixture. 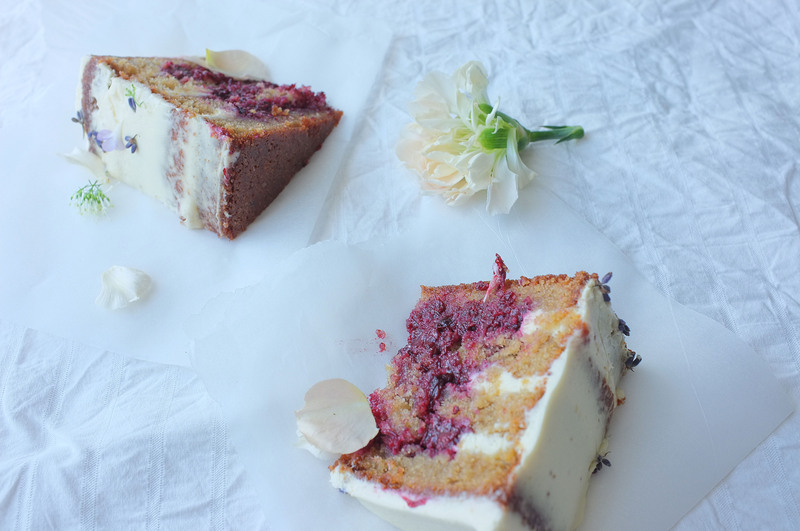 Repeat until you’ve used up all your sponges then spread a light layer of cream cheese icing all over the cake. Chill for 10 minutes (to catch all the crumbs) then spread the rest of the icing on neatly. Finish with the flowers, or alternatively use toasted coconut and lime zest. This four layer ginger cake filled with lightly salted toffee sauce and tangy cream cheese frosting is a great alternative to the classic Christmas fruit cake, and is usually the preferred option in my house. The Scandi-style flowers I’ve used for decoration were sent to me by Bloom & Wild, a brilliant flower delivery company who focus on carefully selecting the best seasonal blooms. The bouquet I received ( the Sadie) is part of their Christmas range and I would definitely recommend you check out their other options; I don’t know about you, but I find it tricky to find a wide range of good quality cut flowers outside of London (I know, first world problems), so it’s great to know I can choose more unusual varieties online and have them delivered straight to my door the next day by Bloom & Wild. 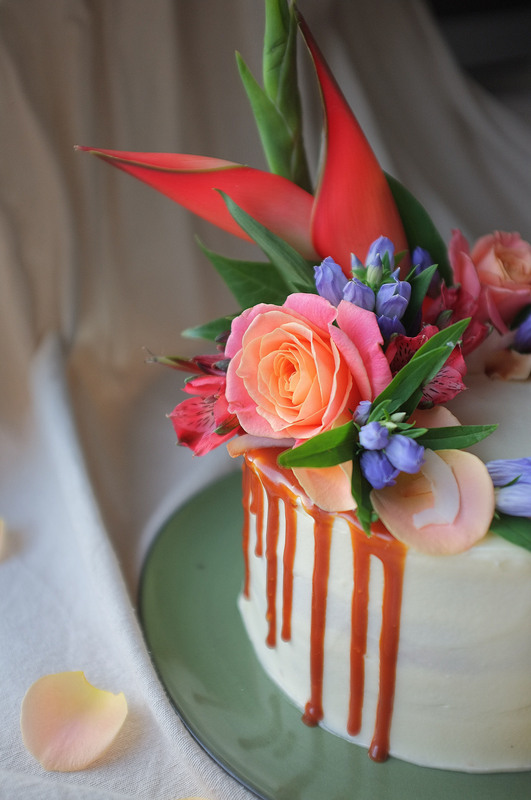 I hope you like how I’ve made use of the flowers and perhaps this could inspire some other botanical themed Christmas cakes! Place the butter, treacle, syrup and sugar in a large bowl (or bowl of a standing mixer). Beat together until light and fluffy. Add the eggs in one at a time along with a little of the flour to prevent curdling. Mix well between each addition. Once the eggs are fully incorporated, sift in the remaining flour, cinnamon and ginger. Fold gently then finally stir in the stem ginger and soured cream. Split between the 2 prepared tins and bake for 30-40 minutes. While the cakes are cooking, make the toffee sauce. Place the butter, syrup and sugar in a saucepan and melt over a medium heat. Once melted pour in the cream and add the salt. Mix to create a smooth sauce then set aside to cool and thicken. Now make your cream cheese frosting. Put the butter in a large bowl (or the bowl of a stand mixer) and beat until fluffy and light in colour. Add the cream cheese and vanilla and beat once again until well combined. Now, still beating, gradually add the icing sugar. Once all the icing sugar has been added increase the speed and mix until the consistency is light, thick and spreadable. When the cakes are ready, a skewer should come out clean when inserted. Rest in their tins for 10 minutes then remove and leave on a wire rack until they are completely cool. Now you are ready to assemble your layer cake. Level off the sponges as best you can then slice in two (you should be left with 4 layers). Place one layer down on your plate or cake board. Secure with some cream cheese frosting if it’s a little slippy. Now spread over a few tablespoons of the toffee sauce. Allow it to sink into the sponge then apply a thick even layer of cream cheese frosting. Top with the next sponge and repeat until the sponges are used up. With the remaining cream cheese frosting, cover the cake all over and smooth down with a cake scraper. Decorate with fresh flowers dusted in frosty edible glitter or get creative and come up with your own design to suit the occasion. Leave the cream cheese frosting rough and decorate with mini gingerbread houses to create a snow drift scene. Top with traditional/vintage Christmas cake decorations. Make little white meringue kisses and cover the top of the cake with them, then dust with gold edible glitter. 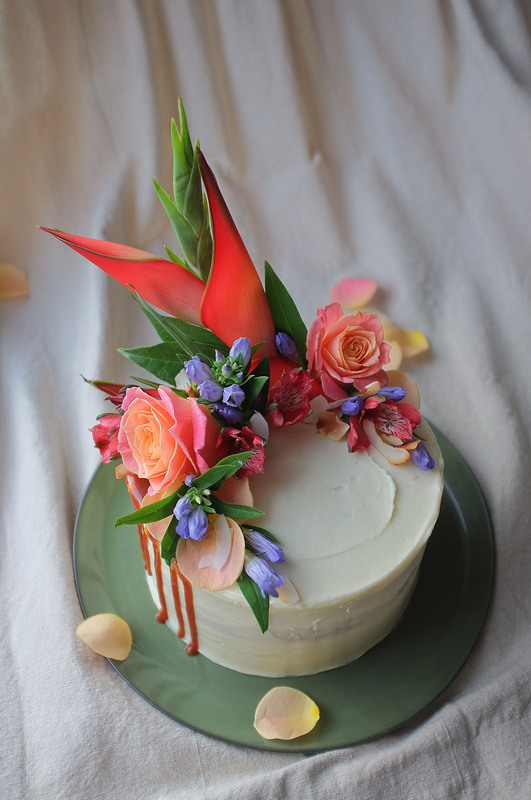 Top with frosted fruit and rustic greenery. 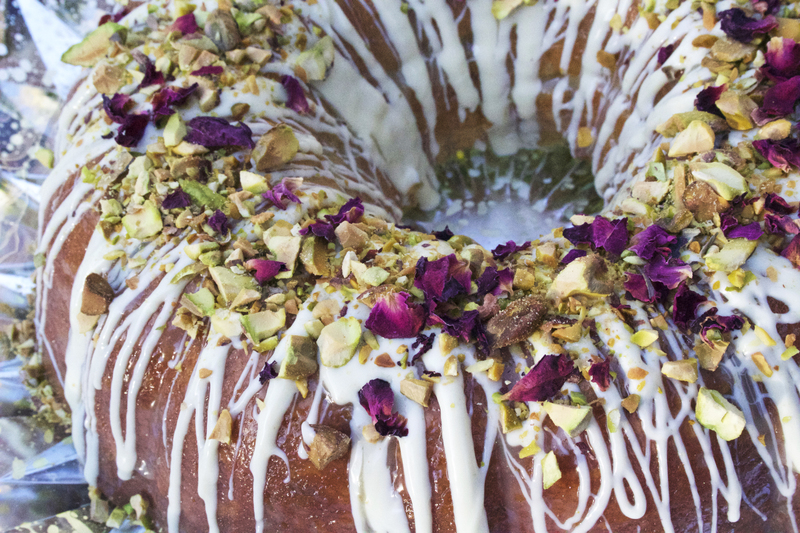 This cake is super easy to bake and is great if you’re looking to experiment with different flavours; the cardamom adds a distinct hum of spice to the light sponge which pairs really well with the earthy pistachios and super sweet white chocolate topping. Preheat the oven to 160 (fan). Generously grease a bundt in with butter then sprinkle over some flour. Shake to coat the edges completely then tip out any excess (this should ensure that the cake doesn’t stick). Cream together the butter and sugar with an electric whisk (or a stand mixer) until light and fluffy. Add the eggs one at a time, beating between each addition (add a little bit of the flour each time if you’re worried about curdling!). Once the eggs are fully incorporated and you have a smooth mixture, add the (remaining) flour, baking powder, salt milk, and cardamom. Whisk until light and well combined. Now fold in the pistachios and scrape the batter into the prepared bundt tin. Even out and bake for 30-40 minutes. When your cake is ready a skewer should come out clean when inserted. Once cooked, rest for 5 minutes in the tin then turn out onto a wire rack and allow to cool completely. While your cake is cooling, melt the white chocolate gently in a heatproof bowl above a pan of simmering water. Set aside to cool. 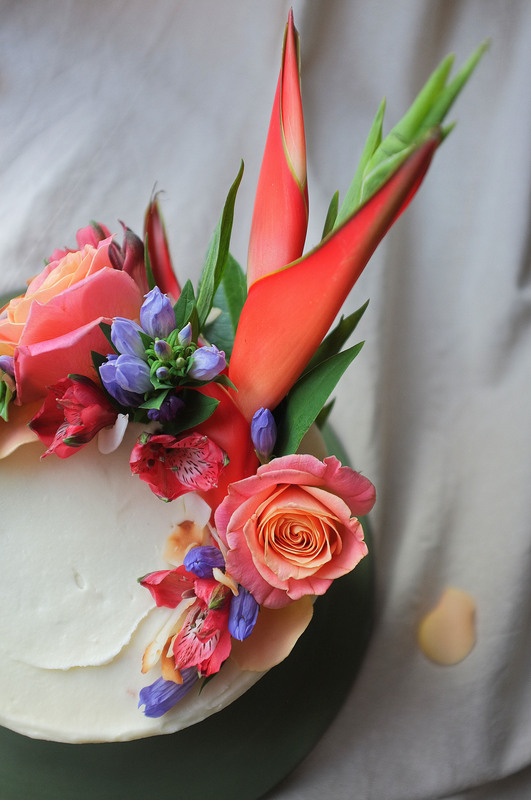 Once your cake and topping have cooled you’re ready to decorate. To do this drizzle the white chocolate over the bundt and let it drip down the sides. 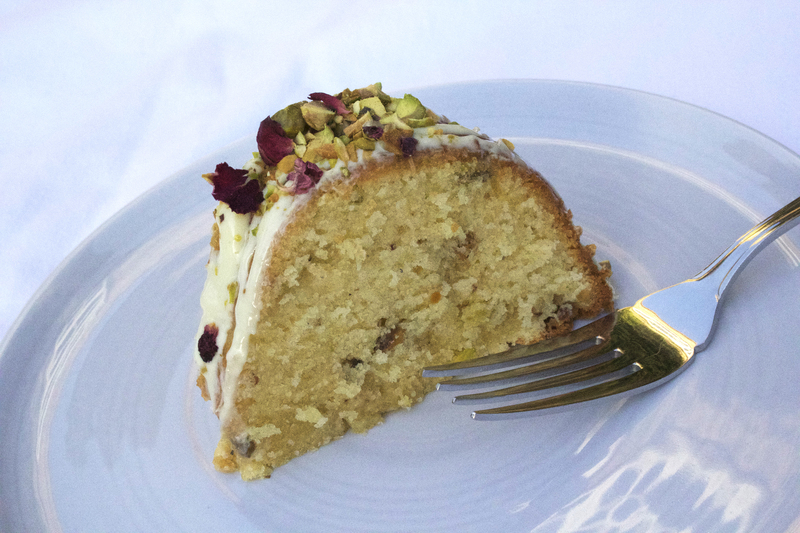 Sprinkle with pistachios and rose petals for a simple but elegant finish. 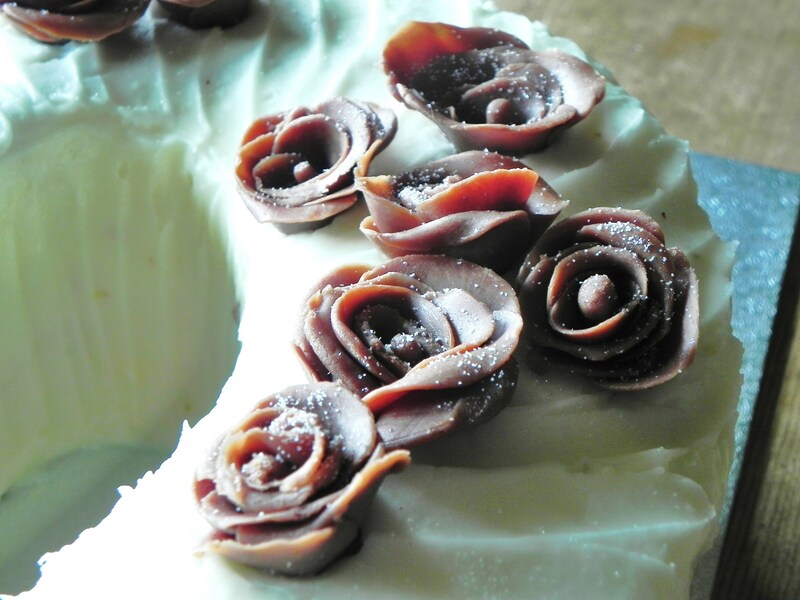 If you’re a frequent reader of this blog, you may well have noticed that my recipes tend to be a little chocolate heavy (it is my vice- I can’t help it). With this in mind, I thought it would be interesting to team up with quality chocolate makers Willie’s Cacao to create a few recipes using different ‘single estate’ bars. By doing this I want to show how different beans create different flavours in chocolate, which in turn taste best when paired with specific ingredients and foods- as with grapes in fine wines. Willie Harcourt Cooze, founder of Willie’s Cacao, focuses on ‘single estate’ cacao; what this means is that each bar is made from beans grown in one very carefully selected location (whether that be Peru, Venezuela or Cuba etc), instead of beans of various origins going into the same chocolate. The company work in this way to highlight how growing beans in varying climates and soils result in contrasting flavoured bars. Having experimented with three of their chocolates, I have created three recipes in which the taste of the specific cacao is (hopefully) highlighted by my choice of flavour pairings. This experimentation has made me realise how important it is to do your research when it comes to chocolate (and any ingredients really), as these bakes have a great depth of flavour I have never achieved before with chocolate based baking. My first recipe is for these orange blossom and chocolate melting moments. For these I used the Colombian Los Llanos single estate bar- it has fruity and floral notes so really works with the orange centre. They are made up of two buttery chocolate biscuits, a delicious chocolate ganache and an orange blossom and fresh zest buttercream. Preheat the oven to 160c (fan) and line 2 baking trays with greaseproof paper. For the biscuits, cream together the butter and sugar until light and fluffy. Sift in the cornflour, cocoa and plain flour then very briefly mix until smooth and combined. The less handling the biscuits have, the more buttery and crumbly they will be. Once the dough is combined, take 1tbsp pieces and roll into balls, then line onto the prepared trays (with a little space between each). When all the dough has been used, press down on the balls with the back of a fork to create the line pattern. Chill for 10 minutes in the fridge. Once chilled, bake for 10-12 minutes, then cool on a wire rack. Meanwhile, make the fillings. For the ganache, grate the chocolate into a bowl. Heat the cream until almost bubbling then pour over the chocolate. Leave to melt for a couple of minutes then stir to combine. Set aside to cool. For the orange buttercream, beat the butter and icing sugar until light and fluffy then add the zest and extract. Stir to combine. Fill two piping bags- one with the ganache and the other with the buttercream. Once the biscuits are cool pipe a ring of ganache around the outer edge then fill the centre with the orange buttercream. Place another biscuit on top to create a sandwich and repeat the process until all the biscuits have been used up. I hope you like these biscuits and find cacao as interesting as I do. 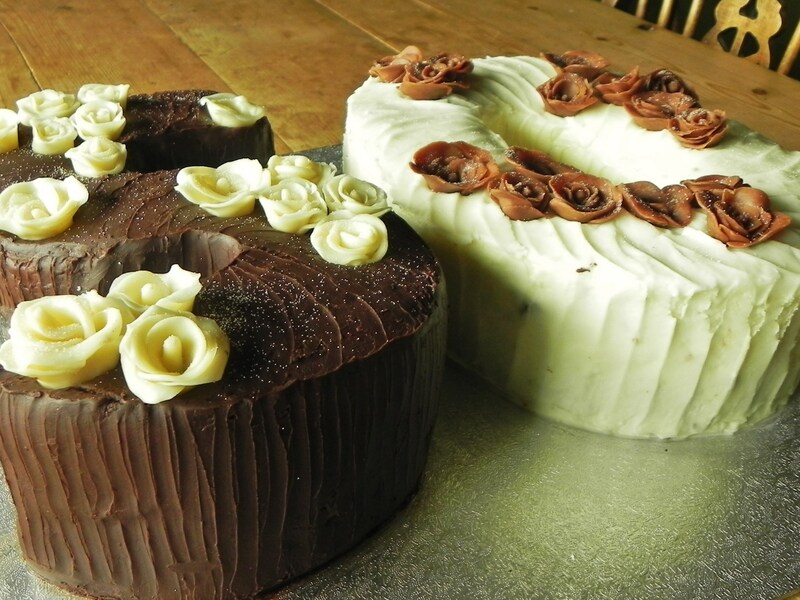 Look out for two more chocolate recipes this week and do give them a try, I’m really pleased with the results! Last week I developed this recipe for a competition I & P Olive Oil Company are running at Leiths; the challenge was to create an Olive oil focused dessert so I just had to enter (anything sweet and I’m there). I came up with this pistachio, cardamom and olive oil tart served with yoghurt cream, powdered raspberries, baked figs and a honey and olive oil dressing… here’s to hoping they like it! Wish me luck! Place your flour, salt, sugar and cold cubed butter in a food processor. Pulse until it resembles fine crumbs. Tip into a bowl and add 2tbsp + 2tsp of the chilled egg/ water mixture. Vigorously mix with a cutlery knife to form large lumps of pastry. If it still looks dry, add some more liquid 1tsp at a time until you can bring it together completely (it is important to work quickly and efficiently so you do not overwork the pastry). Once you have bought the pastry together, form a flat, round disc and wrap in clingfilm. Chill for 15 minutes. Meanwhile, very lightly grease a 20cm tart case with butter. Once chilled, roll out your pastry on a lightly floured surface to a 3mm thickness. Line your tart tin, pushing (but not stretching) the pastry into the corners. Once lined, chill again until firm. Preheat the oven to 200c (fan). Line the tart case with greaseproof paper and fill with baking beans. Bake for 15-20 minutes until the sides are set. Once set, remove the beans and paper and bake for a further 5-10 minutes until sandy and cooked through. Leave to cool. Place the pistachios in a food processor and blitz until fine. Crush the cardamom pods and remove their seeds, then grind in a pestle and mortar until you have a course powder. Whisk the eggs and sugar using electric beaters until pale and thick. Add the olive oil and whisk again until combined. Tip in your ground almonds, blitzed pistachios, half the cardamom and the pinch salt. Whisk again to incorporate all the ingredients then taste- add more cardamom if it is too mild (I recommend doing this as too much cardamom can be overpowering). Spoon the filling into the cooled tart case until almost full. Sprinkle on the spare chopped pistachios. Bake for 25-30 minutes until set and golden. For the baked figs, preheat the oven to 180c. Quarter the figs and place on a baking tray. Drizzle over the olive oil and honey and sprinkle on the cinnamon. Bake for 10 minutes. For the yoghurt and vanilla cream, very lightly whip the double cream with the seeds of the vanilla pod (until only slightly thickened). Add the yoghurt and stir until smooth. It should have a fairly loose consistency and should not be thick. For the honey and olive oil drizzle, simply combine the honey and oil in a small bowl, then set aside. For the last accompaniments, just roughly chop the pistachios (these add a pop of colour) and grind the freeze dried raspberries in a pestle and mortar until fine (these add a lovely sweetness). Cut the tart into your desired shape and spread some of the cream onto the plate. Place the tart and figs on top, sprinkle on some raspberry dust and chopped pistachios then drizzle with the olive/honey oil. 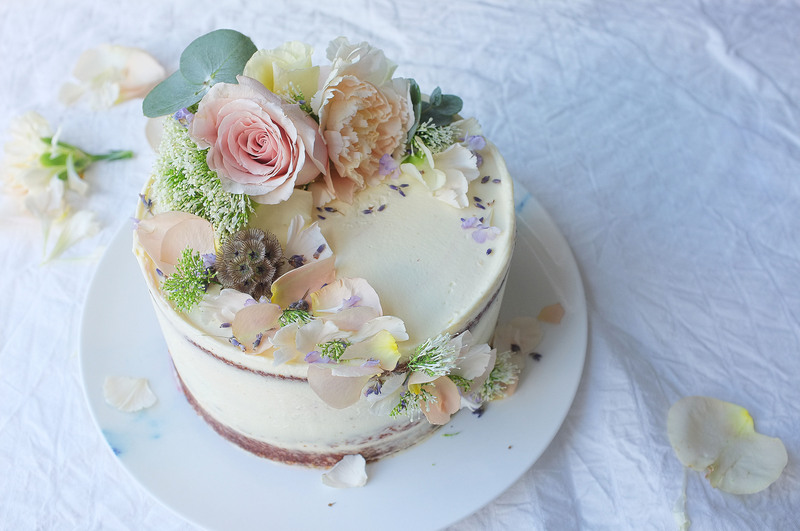 Garnish with edible flowers, such as violas. I hope you like this recipe as much as my family do- I’ve shared 2 presentation ideas too (I couldn’t decide which one I preferred!). When I embarked on making this cake I was skeptical about whether or not my ambitious idea of two different cakes baked with varied frostings, flavourings and colours adorned with hand made chocolate roses would materialise… I had images of wilting roses, mutant shapes and dry sponges on my (forever anxious) mind during baking, so I am relieved with the actual result. 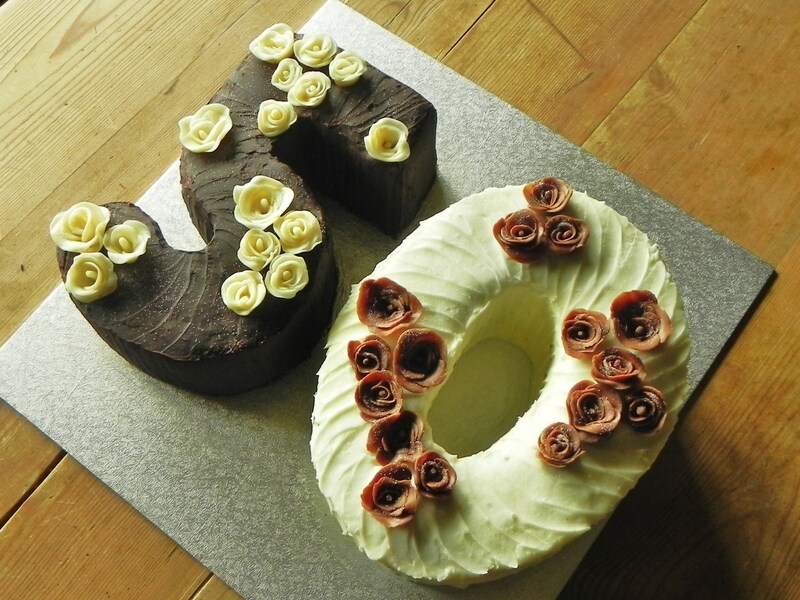 The ‘5’ shaped cake is a rich chocolate sponge filled with milk chocolate ganache and iced with dark chocolate ganache. The ‘0’ is made up of a nutty carrot cake which is filled and covered with cream cheese frosting. 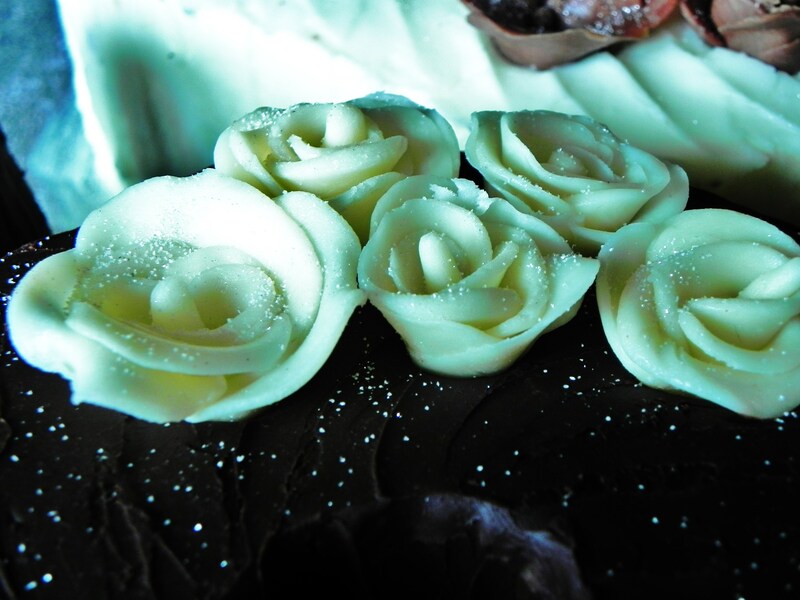 Both cakes are decorated with hand made roses- on the ‘5’ with white chocolate roses and on the ‘0’ with milk chocolate. Having never used molding chocolate before I would certainly recommend it- I prefer it to sugar paste as I find the results a bit more modern and less ‘old-fashioned-wedding-cake’.